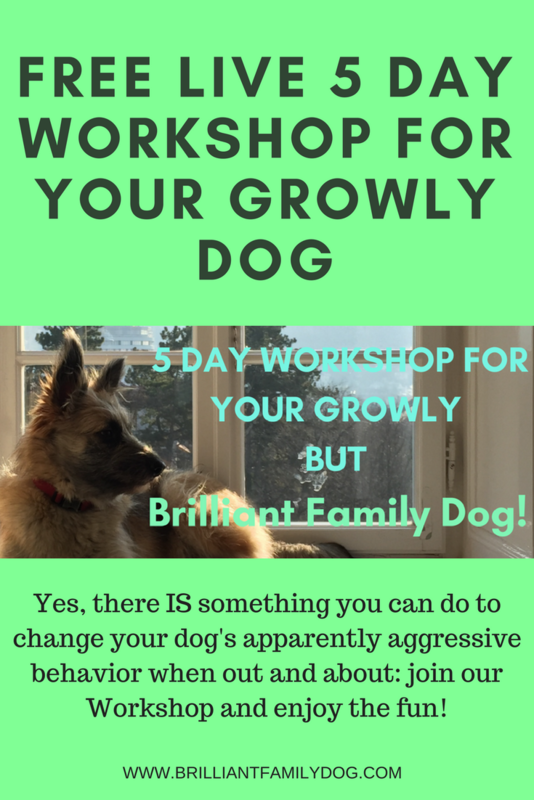 I can honestly say I’m blown away by the response to my invitation to a free Live 5 Day Workshop for your Growly but Brilliant Family Dog. Well over a thousand people have registered, and most of them are busy introducing themselves and making friends in the private forum. I decided to offer this week of free training because I see so many people struggling with difficult dogs. They love their dog and they often have no idea why she’s acting so awkward when out and about. This isn’t helped when it’s a rescue dog with little back-up from the people who homed the dog with them. If you’re new to owning a dog, a rescue dog with a traumatic past is not necessarily the best introduction to this exciting and privileged new world of interacting with another species! There is so much misinformation about - from describing the dog as “dominant”, “stubborn”, “obstinate”, or even “he’s doing it to annoy you”. There are many self-proclaimed experts about who say “he just needs to learn his place”, “you need to be harder on him”, or “you need to use this or that (nasty) gadget to get results,” showing you something that wouldn’t have found house-room in The Inquisition. So don’t flounder about wondering who to listen to. Listen to your own instincts. If it’s suggested you do something nasty to the dog in your care - whom you love! - follow your heart and firmly say “No”. We don’t need to beat or punish our children, and we don’t need to do it to the animals we choose to give a home to either. But he does seem stubborn! Want to know what your dog really thinks? He’s not stubborn - he’s afraid. Afraid to go forwards, afraid to incur your displeasure, afraid of the world. But it’s fear, not stubbornness. Or dominance, or any of that other nonsense put about by people who are talking through their hats. This post may help you with all of that. And you may be surprised to know that it’s not so much months of hands-on training that will change your shy, reactive, anxious, aggressive - growly - dog into the companion you want. A lot of it is in your own head! “Firstly thank you for your wonderful book, it has really helped me understand the reason why my little girl Bess reacts the way she does. Now it was Bess’s owner who changed her view and got success. Bess didn’t have to change at all! A simple change in your own outlook and behaviour can have marvellous results in the way your dog responds. And that’s what people are learning in this Workshop! "One of the best things I have done, the workshop taught me so much." Come and join our free 5 Day Video Workshop and learn. There were well over a thousand people from all round the world already happily meeting, encouraging and enthusing each other in the private group. Friendships were made that will last. What do they have in common? A desire to make life with their difficult dog better without doing anything nasty. At all. They all understand how alone you can be, and people are already feeling less isolated with their dog. While the Workshop is specifically geared for those of you with reactive, anxious, fearful, aggressive - Growly! - dogs, in fact anyone will learn a lot about how to build a relationship with their dog. And they’ll also have a lot more empathy for the Growly Dog owner who they may have disdained previously as being inadequate and unable to control their dog. As you’ll discover, it’s not about control! Head over to the registration page and join us! You can join in with all the lessons and video trainings from the original 5 Day Workshop! Yes, you and your dog can now watch animals on tv!